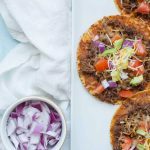 Easy ground beef tostadas are the perfect dinner for busy weeknights! 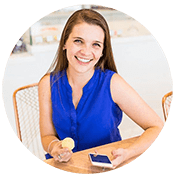 They’re quick to make and can be customized a ton of ways to be your perfect flavor combination! 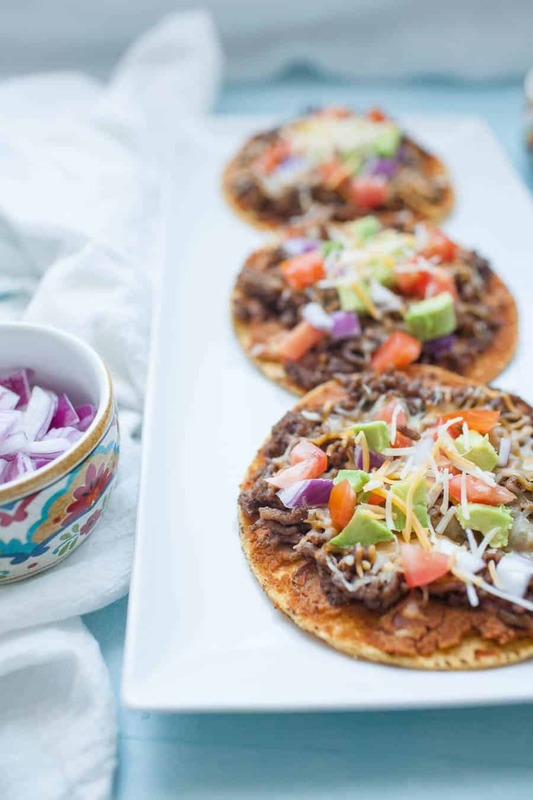 Start with a flat, crunchy corn tortilla and add your toppings like beans, ground beef, tomatoes, avocado, red onions and cheese for a flavorful, quick dinner. It always seems like the turn of the season makes everything go a little haywire. Whether it’s the start of rec sports again, football season, or just back to school, there’s always something going on. 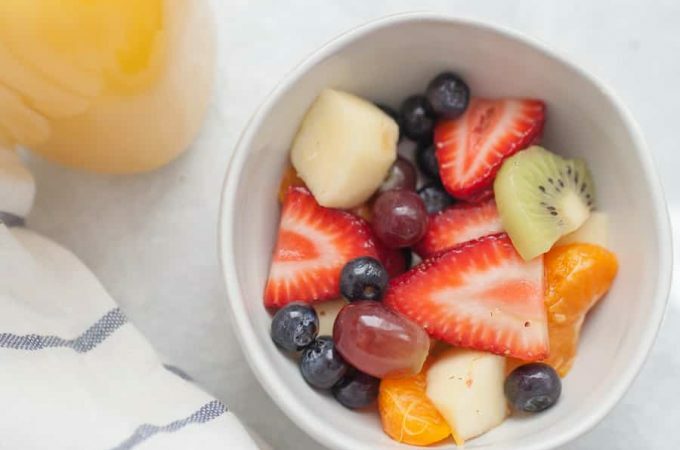 All of the sudden busyness can wreak some havoc on a schedule and on mealtime. Even though we don’t have kids in school yet, we get busy in the fall with church events, football watching and hosting friends. So sometimes our usually like-clockwork dinnertime schedule gets completely off. I love taking the time to cook dinners that take time and patience, but that’s not always an option. That’s why I love having a few easy meals in my back pocket that I know I can count on in a pinch. One of those meals for us is tostadas. They are so quick to make and we can each have them just the way we like them. There was a time where I had never had a tostada. It’s not really your usual Mexican food option, I guess. Nachos, burritos, tacos are definitely more common. But tostadas are quite a fun change from the usual. If you’re not familiar, it’s basically a flat crunchy corn tortilla with the toppings all on top of it. You bake it for a few minutes, basically until everything is heated, and you’re all set. 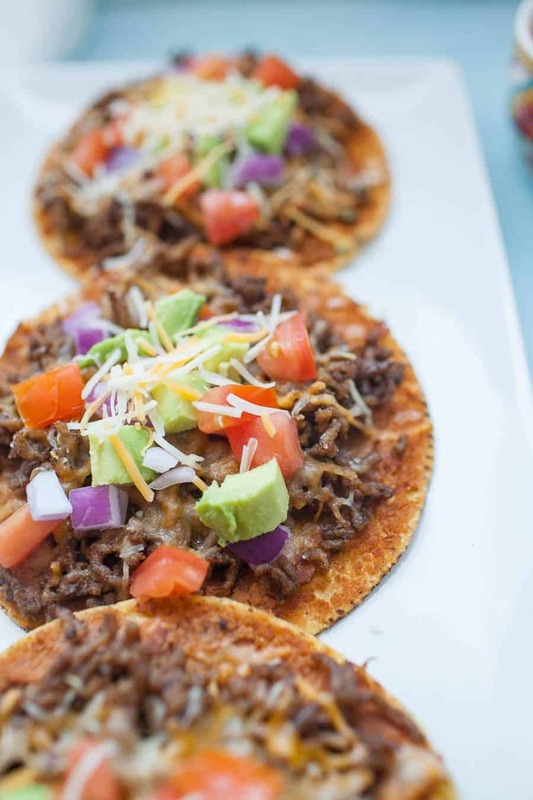 Our go to are these easy ground beef tostadas. We tend to substitute ground turkey a lot too, but using ground beef is a nice go to for us since ground beef has so much flavor. The concept is really similar to these beef taco lettuce wraps I shared at the beginning of the summer. We usually keep it pretty simple, since that is the brilliance in this recipe, but you can also make fancier tostadas or use it as a great way to use up some produce. Every time we make tostadas, they’re a little bit different, but there are some staples that we always have. Refried beans (for my son and I) are the base of the tostada. This helps with flavor and also gives your tostada some “glue” to hold onto the rest of the ingredients. My husband doesn’t like beans, so we will use mashed avocado for his and it works really well too. Then comes the meat and toppings. I almost always have tomatoes or salsa and avocado or guacamole on mine. And cheese, of course! Another “glue” ingredient that helps keep everything together so that when you take a bite, the ingredients don’t all fall off your tostada. So the next time you’re in a pinch for a quick dinner (or lunch!) try these quick ground beef tostadas. 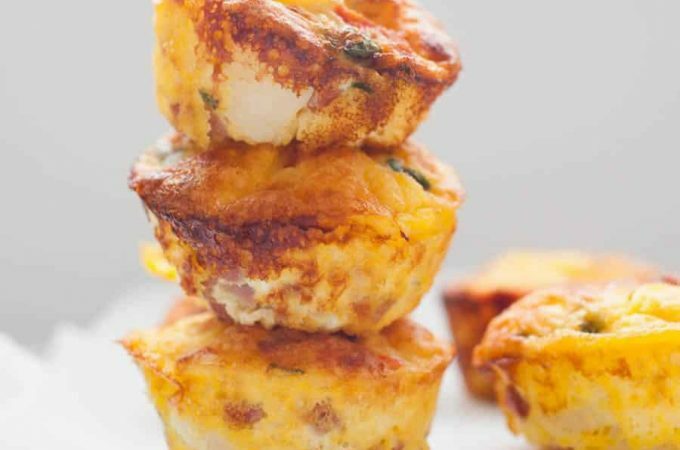 You’ll be glad you got food on the table quickly without sacrificing taste. Ready to find out how? 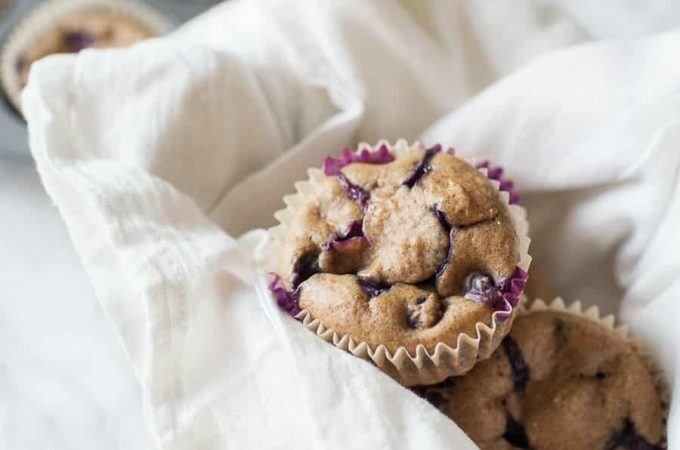 Scroll for the recipe! 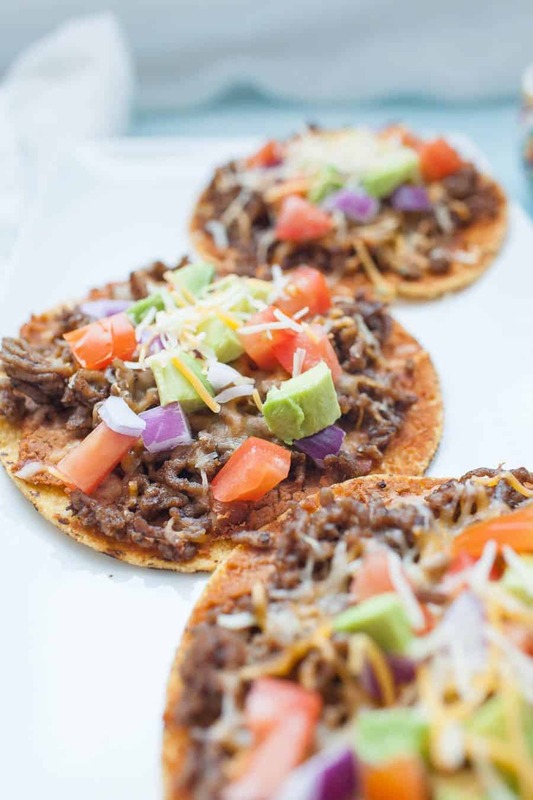 Easy ground beef tostadas are the perfect dinner for busy weeknights! 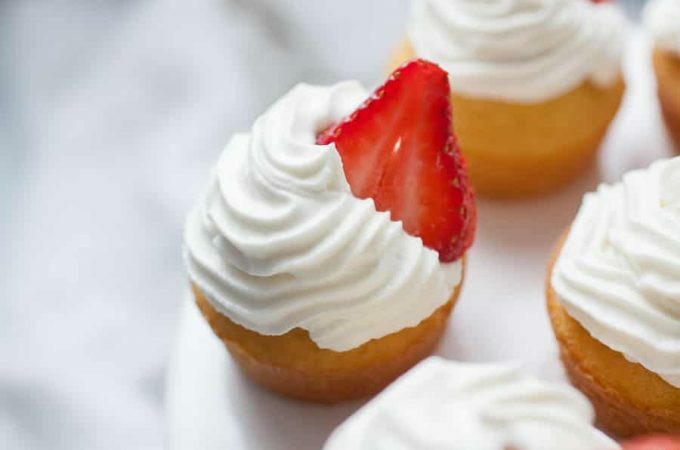 They’re quick to make and can be customized a ton of ways to be your perfect flavor combination! 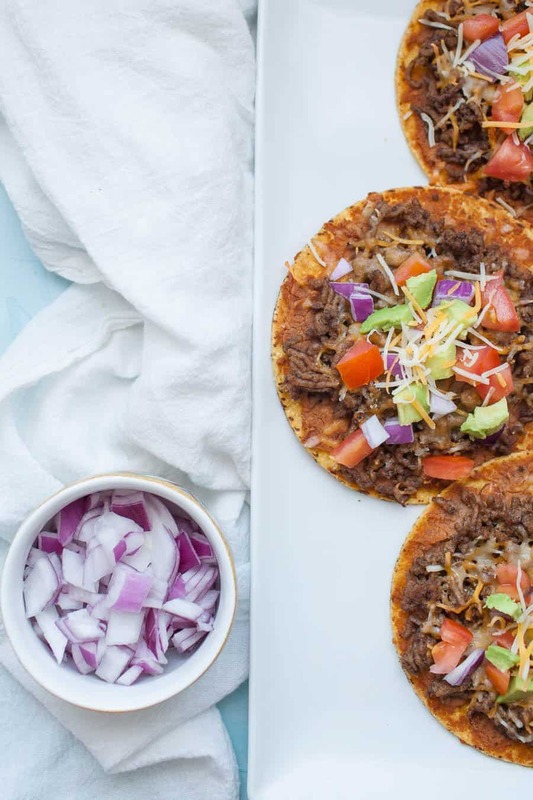 Start with a flat, crunchy corn tortilla and add your toppings like beans, ground beef, tomatoes, avocado and cheese for a flavorful, quick dinner. Brown ground beef. Drain any excess grease and return meat to pan. (This step is KEY so that your tostadas aren’t soggy). Then add 1/2 cup of water and taco seasoning. Stir to coat ground beef. Heat refried beans in microwave for about 30 seconds to make them easier to work with. Spread a thin layer of refried beans on top of each tostada shell. You want most of the shell to be covered, but don’t want a layer too thick that will make the tostada soggy. Spoon seasoned ground beef onto refried beans. Add a layer of cheese on top of beef. Add diced tomatoes, red onions and avocado on top of tostadas. Top with additional avocado or salsa, optional. You can smash whole beans to create your own “refried beans” layer, if desired as an alternative to refried beans. If making ahead of time, I recommend keeping the ingredients separate until it’s time to eat. Do not add salsa or any other sauces to tostadas until after they’ve baked so they do not get soggy. I have never had a tostada but now I want to make them all! It looks so good!